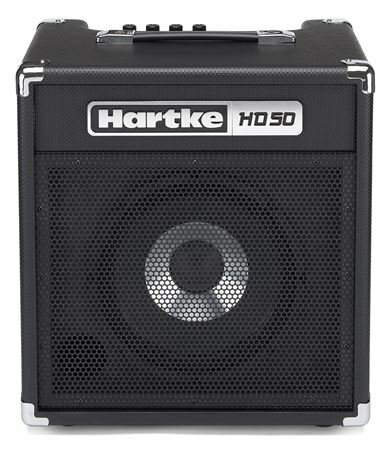 The HD50 Bass Combo packs Hartke's patented HyDrive speaker technology into a sleek, 50-watt combo design ideal for small venues, rehearsals and more! The HD50 Bass Combo packs Hartke's patented HyDrive speaker technology into a sleek combo design ideal for small venues, rehearsal spaces and bedroom practice sessions, and capable of greatly enriching your low-end tone. The HD50 also maintains Hartke's commitment to producing high-quality bass amplification with exceptional durability. The HD50 (50 watts, 10 inch driver) employs Hartke’s patented HyDrive Speaker Technology that offers a carefully crafted hybrid (half paper, half aluminum) cone bass speaker. By combining the warmth and roundness of paper with the punch and attack of aluminum, the HyDrive design produces serious tone that is ideal for bass players of all genres and styles. Packed with professional features, the HD50 combo is designed to be user-friendly and reliable for players of all levels. The combo offers Volume, Bass, Mid and Treble controls on its top-mounted amplifier panel, allowing for easy adjustments. It also features an 1/8 inch stereo Aux input for playing along with your favorite tracks via an MP3 player and a 1⁄4 inch headphone output for more intimate practice sessions. In addition, the HD50 has a built-in limiter to ensure constant amp operation at safe levels. Lastly, its solid enclosure is finished in a stylish fashion with a sleek, perforated metal grill and molded strap carry handle. Great amplifier, plenty loud, exellent tone, well worth the money. This is the very best Bass Amp for practicing made period!! At the price point it was being offered up at, I figured at the least, I could practice on it, but after I plugged it in and started using it, I quickly realized the Hartke HD50 Combo Amplifier, was far more than a simple bass amp for purposes of practicing alone, I began using it for a get together, which quickly morphed into jamming with my buddies and I even started using it in studio applications, the sound from it is clean, crisp, fat, punchy and very well rounded, so recording it has been a pure joy. Who knew a little 10 inch speaker could do so very much, like how the auxiliary port allows me to play my mp3 collection in pristine sound, with unrivaled clarity in such a small and compact form factor, while still providing such amazingly great low-end support? Apparently Hartke knew and they proved it to me, by creating one of the very best uses of my hard earned money, by making an incredibly affordable bass amp, which just happens to be the very best little bass amp period!! Great amp for the price .